At least nine civilians have been killed in twin attacks in eastern Burkina Faso, a poor West African country where jihadists have been gaining ground in recent months, local authorities said Saturday. “Two terror attacks were carried out in the villages of Diabiga and Kompienbiga” overnight Friday in eastern Kompienga province, the regional governor said in an earlier statement. An unnamed security source told AFP that one of the attacks had targeted the home of a Islamic religious leader and other Muslims. “Five people including the leader were killed,” he said, adding that three others were injured on the attack on the house which is next to a mosque. One of the injured later succumbed to their wounds. Meanwhile, “three people belonging to the same family were killed and another two injured by suspected jihadists on mopeds,” according to another security source. Since 2015, Burkina Faso has battled increased Islamist violence of the sort that plagues neighbouring Mali and Niger, and experts say the recent surge is likely the result of pressure on jihadist insurgents there. 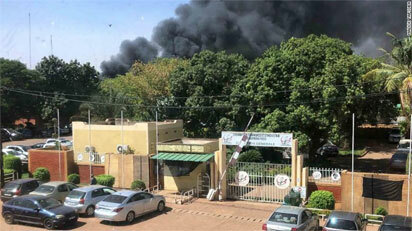 The capital Ouagadougou has been hit by three attacks over the past two years leaving a total of 60 people dead. Last week Burkinabe President Roch Marc Christian Kabore promised new security measures “to eradicate the scourge of terrorism”.